Needing a break after being home for some 6 weeks, and with Peter working renovating, and me still sorting out books and school stuff, we headed off in the direction of Lightning Ridge, N.S.W. We arranged on our first 2017 Road Trip to Tamworth, to catch up with friends of almost 30 years, Steph and Eddie. 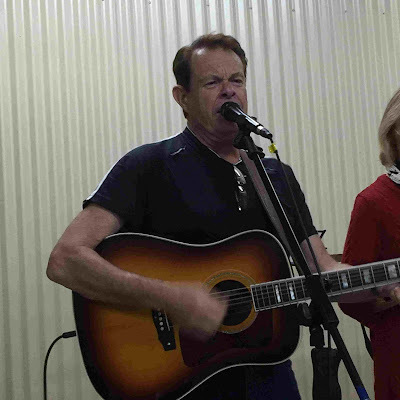 They were doing a Graham Rogers Country Music Tour that ended in Lightning Ridge. We only had planned about 10 days away, before needing to be home again for other commitments, so the first few days were long 3 – 4 hour drives and overnighters. After a few last minute house tasks we headed off. First stop was Warwick for lunch and petrol. Next was Inglewood in Queensland for overnight. This is a free site provided by the town and it is well looked after, even providing free firewood for the barbecue. There are no toilets or water available, and one must be fully self-contained, but on the other side of the highway there are toilets, potable water and a dump point. 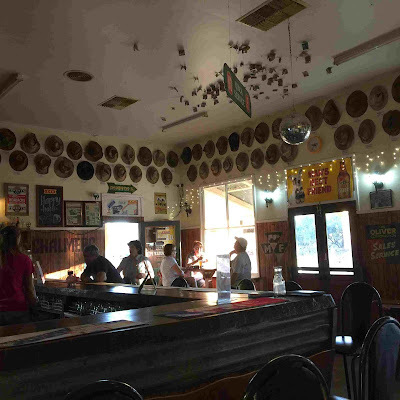 The town has a few cafes and a pub, and a great pizza shop. We stocked up on milk, bread, and ham … and Peter had his coffee -$4.50 - 7/10 and he was happy. We next stopped at Yelabon to look at the remains of the old dingo fence, which was interesting. 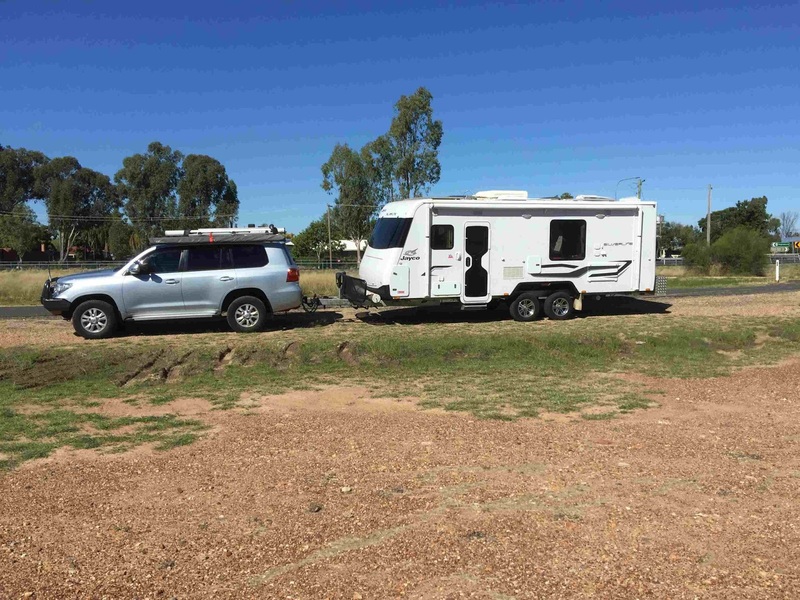 We stopped at Goondiwindi for petrol and continued along the Cunningham Highway to the Barwon Highway. We saw lots of cotton on the side of the road, so it must be harvesting time. 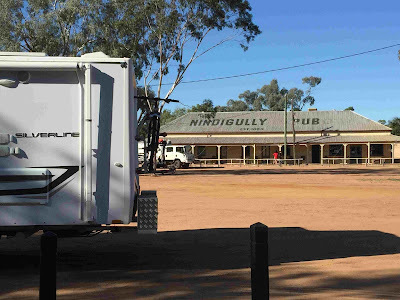 Our next overnight stop was Nindigully Pub. We have been here before and obviously got here a little late as there would have been about 40-50 vans already here. 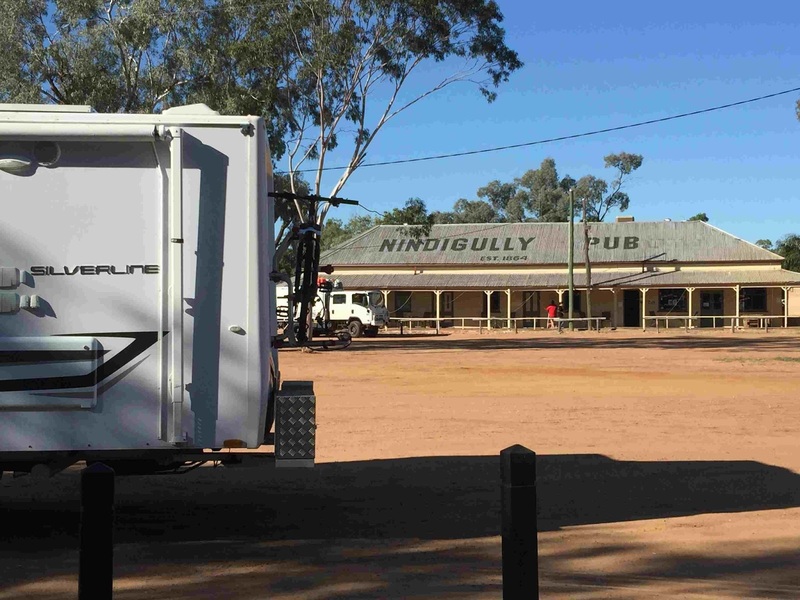 We camped along side the Mooney River, across from the pub. There is a short walk along the river that has information boards about the history of the area. The pub has a happy hour at 4.30pm and a bell is rung to let all the campers know. Drinks are $1 of a middy and house wine. Dinner menu is a little expensive, but if one can get there for lunch the prices are reasonable. We (as in Peter) had a few beers in the beer garden and watched as the camp fire was lit. They do not have moscato or sweet wines, so I drank water. It is a very interesting pub and well worth a look. Walking back to the van we could hear the cows mooing across the river as they were herded back to where-ever. 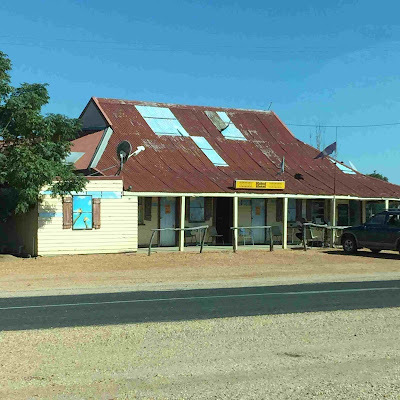 The next day we took a different road, the Thallon-Dirranbandi Road, which was much better, to Lightning Ridge. We checked in to the Opal Caravan Park and found Steph and Eddie. 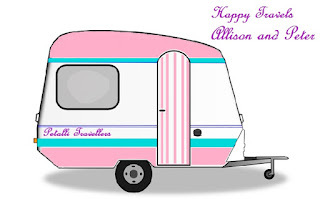 This is a lovely caravan park, although a little expensive. It has much better facilities than last time we were here, and although it is a fair distance from town, it is close to the hot artesian baths. 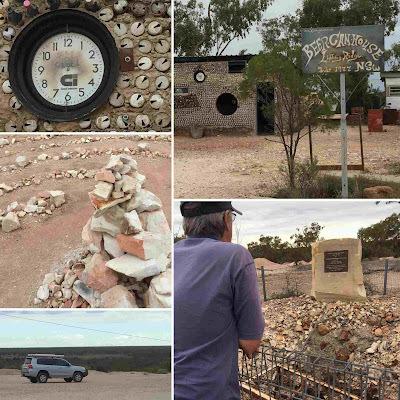 We like Lightning Ridge, and have been here a few times. Just so much to see and do. This time we chose to do the Green Car door tour again up to Nettleton's First Shaft. This was built in 1902 by Charles Nettleton, and although he found no opals at first, he did in future shafts. There is a labyrinth there that was built about 2011, no one is sure by who, it just appeared. One walks around the maze and contemplates good thoughts. Also at the site is an old house made of mostly cans. It has been added to since the last time we were up here and now coloured bottles form a part of the structure. 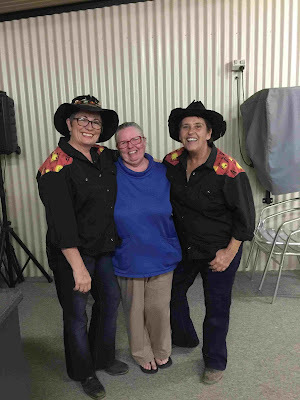 One of the great things at Lightning Ridge is the duo – Mel and Susie. 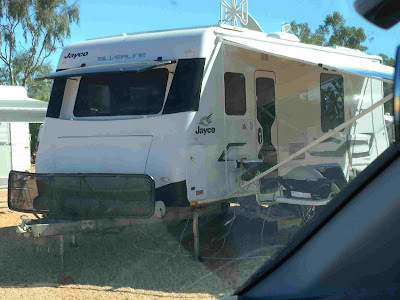 We first saw them in Winton, and have been following them (maybe stalking) on FaceBook. They are very good story tellers, and are now based at Lightning Ridge and perform 6 afternoons a week at the Opal Caravan Park. As we were meeting up with friends on their last leg of a country music tag along, we were happy to see some new artists that we did really like. Trevor Tolton is a young performer that has a voice that reminded me of Mark Lindsay – anyone remember him?? 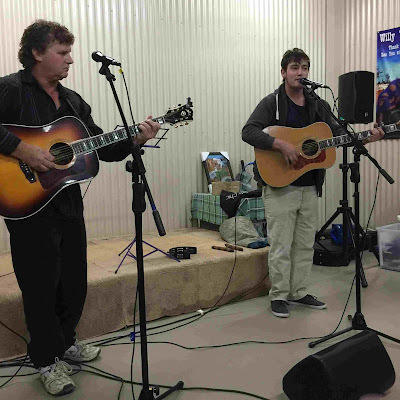 Here Trevor (right) is performing with Alan Percy (left). Here is the star of the Tag-along Graham Rogers. We enjoyed the concerts. 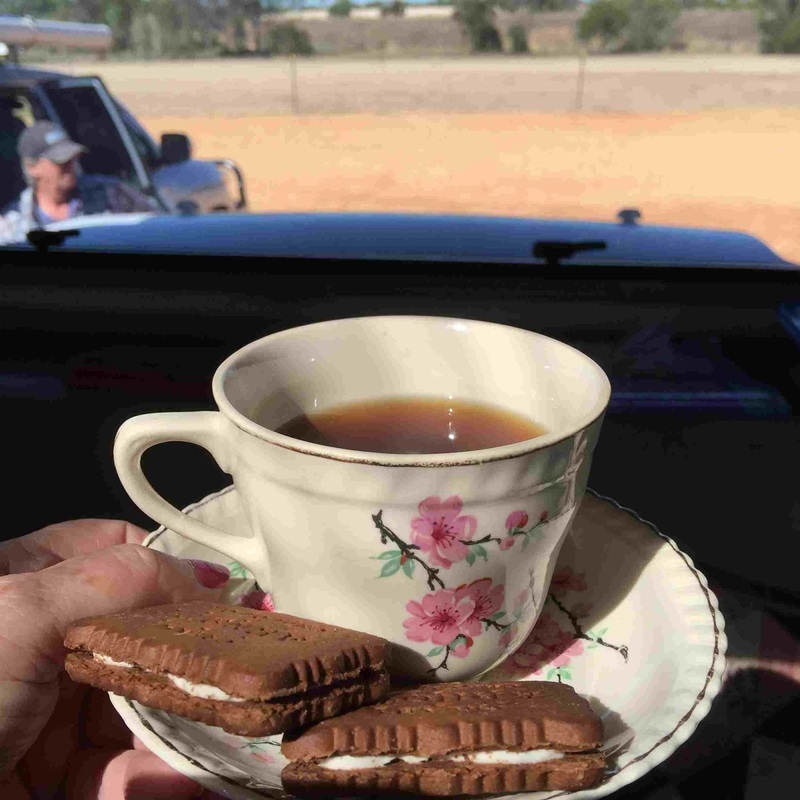 After a great 3 days at Lightning Ridge, 4 vans with 8 of us headed north to St George. We stopped at Hebel, just over the border on the Queensland side. There is not a lot there. A general store (with terrible coffee) and a pub. 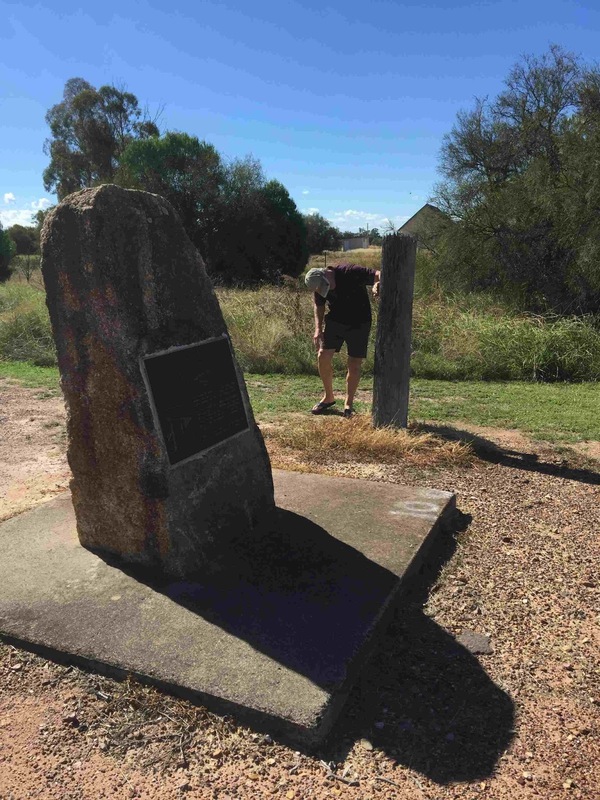 It is believed the Kelly gang frequented back in the day. There is a free camp north of St George, off the Carnarvon Highway before one gets to Beardmore Dam and along the banks of Lake Kajarabie. There is room for a few vans right beside the lake, and room for many more just up on a flat part of the camp. We set up, keeping in mind the large overhanging trees, and stayed two nights, simply relaxing. 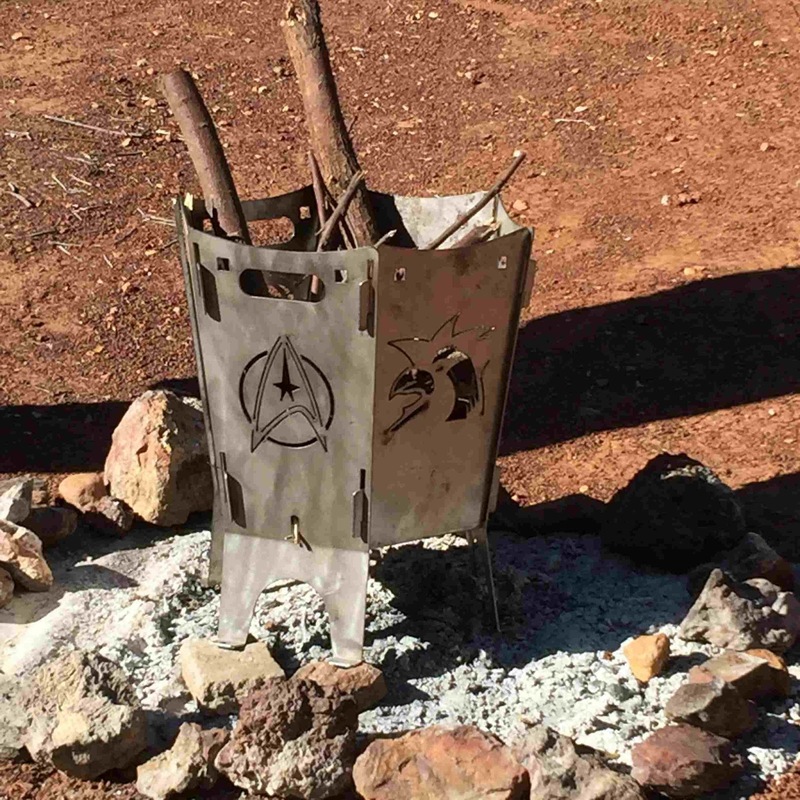 We also were able to have a fire, so we got to use our new fire pit. It was great. We had a great catch up with Steph and Eddie, but the next day we parted ways as we headed further north-east, and they headed south. We had planned on staying the night at Westmar camp, but the toilets were closed and it was a little exposed to the highway, so we continued on to Dalby. We can upon Bowenville Reserve. How have we not been here before?!?!? 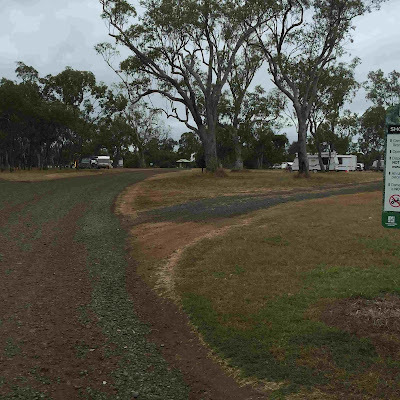 It is a large open grassed area on the banks of Oakey Creek. There are so many places for vans. The only down side is there is one small toilet block, so one really needs to be self-contained. We liked it so much we stayed an extra night before heading home. 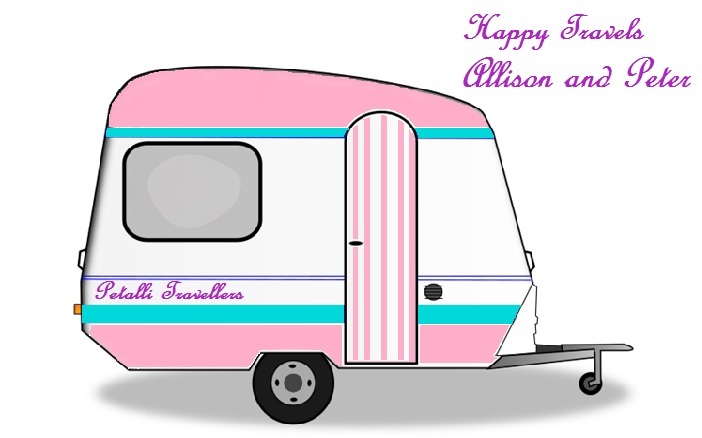 So home again for a few weeks and then another road trip - woo hoo! It's so nice to get away for little road trips - much better than working!! !